With the great reluctance of people to part from their laptops, I could almost swear that it has become one of the basic needs of man like food, clothing, and shelter. We see those conspicuous black shoulder bags lugged on by travelers everywhere. It wouldn’t be so weird if the purpose is work-related since there will be no question of bringing the laptop but as to why holiday travelers would prefer to bring theirs is beyond me. And so they say they need to stay connected to their workplace even when on vacation. They also say they need to upload pictures, browse the Internet, and so on and so forth. The reasons are endless. I wonder why they had to leave in the first place. Bringing work on family vacations is unfair to the family who has waited long for the opportunity to bond. Minimal communication requirements can easily be addressed by smaller gadgets such as phones. Card images for pictures taken by digital cameras can be transferred to a CD while sending the same pictures through email can easily be done through an Internet cafe. In other words, there are other ways of doing what you need to do with a laptop especially if it would be only for a limited period of time such as a vacation or holiday. Bringing an expensive equipment like a laptop along while traveling is just too much responsibility and distraction to truly enjoy a leisure trip. It will always be a security concern whether it is left in the room or brought along in sight-seeing. More than the cost of the equipment itself, losing the important data it contains represents a higher threat when it finds its way to unscrupulous criminals. Give yourself a break and travel without your laptop once in a while, I’m sure it wouldn’t hurt that much. Everyday, when I check out the news online, I see at least one piece talking about a stolen laptop and related topics. In spite of the widespread use of laptops (or perhaps because of that, actually), thefts seem to be more prevalent. Perhaps the temptation is too strong for thieves, and perhaps there is also some negligence on the part of some users. What the thieves do is beyond our control, but as for negligence, there is a lot we can do about that. Just a short while back, I wrote about the SAFElinkTM Anti-Theft Service, which is a good way to secure your data and even possibly retrieve your laptop in case of theft. There are other similar options, but many of them are, understandably, offered for a fee. Here comes the good news – I just discovered a laptop security service that you can use for free. Yup, you read that right – FREE. It is called LockItTight, and it functions pretty much the same way that other security services do. Location Tracking. The software reports the laptop’s location to your LockItTight account regularly. If you can’t find your laptop, you only have to log in to your account using another device and pinpoint your laptop’s location. Screen Shots. This feature gives you an idea what your laptop is being used for. Webcam Capturing. The ultimate proof – a web cam photo of the person using your laptop, who is presumably the thief as well. Key Logging. This will give you data to make it easier for you to hunt the culprit down. File Tracking. This allows you to retrieve and wipe your data remotely. Encrypted Reports. LockItTight employs high security measures to ensure that your data in their servers are locked down tight. Again, the best thing is that all this is for free, but yes, there is a catch. One, you can only use the free version for one laptop. Two, the free version reports the laptop’s location only every two hours. To use the software for more than one laptop and to customize the settings, you can get the paid version for as low as $1.99 a month per laptop. Another thing is that it is only compatible with Windows. In my previous post, I wrote about SAFElinkTM, the new anti-theft service being offered by PlumChoice. This service takes care of your data in case of theft or loss, doing so via a software-based and cloud-based system. Now let’s go back to more immediate security issues. When I say immediate, I don’t mean to discount what services like SAFElinkTM can do for laptop users. I am only thinking about how I go to a coffee shop practically every day to work for a couple of hours. For many people, using their laptops in public places is also a common occurrence. This is really the trend these days, and I don’t see that changing any time soon. For those of you who spend considerably long periods at coffee shops, you know very well that at some point, you have to go to the ladies’ or men’s room. Either you pack up all your stuff and take it with you – risking the loss of the table to some other customer – or you leave your laptop at the table secured by a laptop cable lock. These locks have gained popularity simply because they offer an effective solution. I have to admit, though, that I have never used one of these locks. Maybe I am just too paranoid. And maybe I am right! Just recently, the security – or lack of it – of cable locks have been examined. In a post by Marc Weber Tobias ((Source)), it was shown that one of the most popular laptop cable locks takes only seconds to crack. Hewlett Packard’s laptop locks – models BV411AA and BV411UT – apparently do not pose much of a challenge to the dedicated (or maybe even half-hearted) thief. Tobias shares that all he needed was a screwdriver to get a lock open. Watch and see. There is the possibility that thieves may immediately be turned off once they see that a laptop has the lock connected. They probably would not even bother to sit there and fiddle with the lock with a screwdriver, true. But the issue is that people are buying these locks with the idea that they provide absolute security. If you are one of those, you might want to reevaluate and avoid leaving your laptops even with the locks on. As for me, I really am too paranoid to leave a relatively costly machine alone in a public place – laptop lock or not. 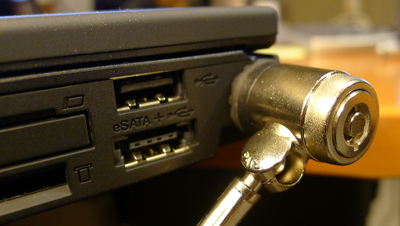 Do you use laptop cable locks? How confident are you in using them? News of hacking, hackers, security breaches, and what have you has been going around for quite some time now. For sure, many an average person has had a concern or two about just how safe they are. All this hullaballoo reminds me of something I have heard from someone – “everything can be hacked, all you can do is to make it a little harder for the hackers”. Or something like that. Of course, there is also the possibility of having your laptop stolen. Not really hacking, but still a security breach for sure. More than a security breach – think about all the data that you have in there! Unless you are meticulous about backing up your data to an external hard drive (or some other form of storage), then you just might be in danger of losing lots. If you want to take some positive action towards ensuring that you’ve got your back covered, so to speak, then you might want to take a look at the SAFElinkTM Anti-Theft Service ((Product Page)), which has just been launched by PlumChoice ((Web site)). This company is a provider of remote technical services and aims to help users ensure that their data is protected in case their laptop gets lost or stolen. The user’s laptop has to have the software, which then communicates with the SAFElinkTM servers. In case of theft or loss, the laptop is basically locked down. This prevents unauthorized access to the data contained in the hard drive. There is a way to undo the lock down, but if there is no authentication done after a certain period of time, the machine’s drive will wiped clean by the system. Obviously, this is to make sure that the data will not be accessed by unauthorized persons. What’s great – and rather important – is that the system is highly configurable. That is, users can configure things such as files/folders which can be protected by SAFElinkTM; the period of time wherein a locked down laptop can be unlocked/authenticated; and so on. The service also comes with a cloud-based back up system, which takes care of having a duplicate of the data and gives users the freedom to wipe the drive clean if it is ever stolen. Now we just need to trust in the security of their cloud-based back up system.